Reisen Sie inmitten einer atemberaubenden Landschaft bei einem unvergesslichen Tagesausflug durch die Cascade Mountains. Ihr Fahrzeug wird den Stevens Pass besteigen, entlang des Skykomish River fahren und Ihnen die Aussicht auf Bridal Veil Falls und Deception Falls auf dem Weg nach Leavenworth bieten. Bei der Ankunft in der bayerischen Stadt haben Sie zwei Stunden zum Mittagessen (auf eigene Kosten) mit Freizeit zur Erkundung der Weingeschäfte und Kunstgalerien. Weiter über den Blewett Pass, eine alte Goldgräberstadt und die Snoqualmie Falls, eine erstklassige Naturattraktion. Tour operator - Cheryl's Northwest Tours. 9 hour tour, included stops at waterfalls on the way to Leavenworth. Town itself is very picturesque, makes you feel like you are in Germany. Cheryl (tour owner) was incredibly accommodating in meeting our needs to make the tour happen, Carol the van operator was pleasant, did a good job narrating, and showing us points of interest around town. 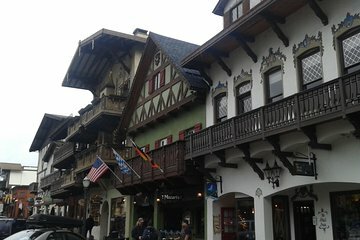 This was an amazing tour of the waterfalls and the Cascade Mountains as well as the beautiful, quaint town of Leavenworth. Cheryl, our tour guide was fantastic. She is warm, friendly and puts you right at ease the moment you meet her. She is so knowledgeable about the surrounding area and has some interesting stories regarding the region. You never feel rushed at all, but instead Cheryl allows you to take the time you need to take photos and just take in the magnificent beauty of all the places she takes you to see. I would highly recommend this tour if you are visiting Seattle. Cheryl was a great informed tour guide plus a good safe driver. The Cascade mountain tour was awesome. It began with Bridal Veil Falls, were sasquatch lives .Next was Stevens Pass Resort, nice ski lodge. Now getting to about 4000 feet elevation saw mining towns and holes. Headed to Leavenworth had a wonderful lunch of brisket burgers and fries. It was so tender. We were to tired to shop. Headed for Deception Falls!!!!!!!!!!!! Oh so fantastic the woods and the hike through the falls was amazing. All worn out time to stop at Snaqualmie Falls. Beautiful but no more hiking. Cheryl told us about the Skykomish and Snowkomish Indians and the trees of Washington State. Hemlock, western red ceder and Douglas fir. We stopped along the road to Seattle and got some cherries! People in the airport wanted to know where did I get them. since their not in the grocery just yet. I can't express how much we enjoyed this tour.